A “frantic call” from an author wanting to make changes before a book goes to press is not the fault of a first-time author. It’s the fault of a green publisher who hasn’t had the book vetted by a lawyer to ascertain whether there are any liability issues. Did the publisher bother to ask the author who, if any, of the family members had read the edited manuscript before it was copyedited (copyeditors fact check–at least, professional ones do) and then set into galleys (the typeset form, where pages now look like book pages; this is the stage at which the book is first sent to potential reviewers)? 3) do research that shows that these details have been revealed before in the media with no protest from the person who might have felt offended. As you can see, in the latter case, you are unlikely to find anything on nonfamous people whereas you can easily establish that certain well-known figures have been publicly inebriated, entered rehab, been charged with a misdemeanor, and so on. If you have any concerns whatsoever that someone might be offended by how you’ve portrayed them in your book, make sure that a qualified lawyer literary lawyer vets the manuscript or sections of it. Major book publishers have lawyers on staff who do this work regularly. There are also independent literary lawyers who can vet material for you. And read your book contract carefully. Push not just for “mutual agreement” on a title or subtitle, but for “approval.” You may not get this concession but it’s worth asking for. In the end, this is your book and you want to feel proud of it. Don’t get pushed into a wretched, potentially libelous title or subtitle! I couldn’t be prouder of my cousins Jacob and Mischa DeHart, whose Spaceship Collaborative recently launched the Culinary Culture site. Here’s a Chicago Magazine profile of them. Jacob’s company, Threadless.com, pioneered the idea of creating an online community that organically determines the nature of the site and the revenue streams. I was thinking about this yesterday when my husband, George, went to 5 stores trying to find an inflatable tube for sledding. “Oh, we’re a camping store.” “Oh, we only sell hard sleds and saucers.” Five retail stores, all hurting for business in this economy, all narrowly defining themselves according to what they want to be instead of what people are asking for. It’s Wisconsin. It’s winter. 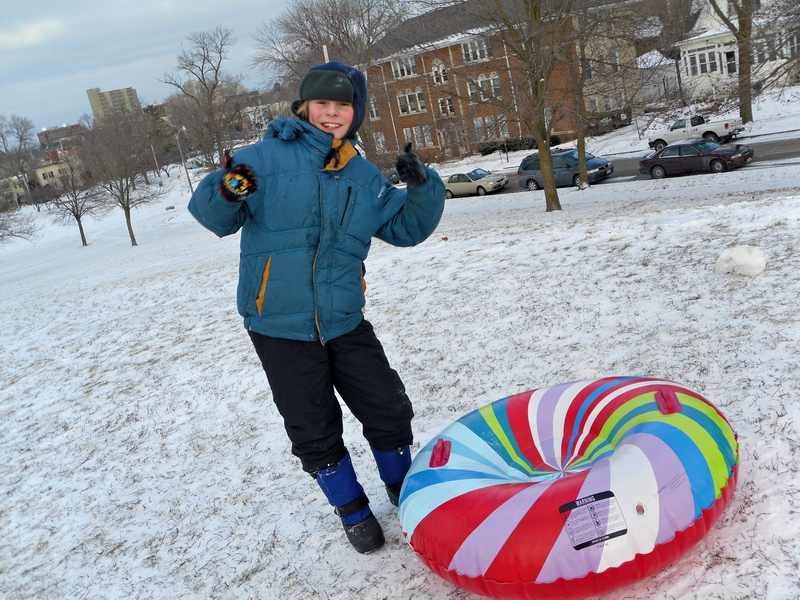 The tubes are easier on your spine if you’re over 40 and joining in the fun on the sledding hill. Why not take a cue from the customers? Authors and publishers also have to take a cue from the customers. If people find it daunting to buy a book that presents material in one form, then why dig your heels in and say, “Well, that’s what a book is. If you don’t like it, well, that’s your problem.”? Here’s the perfect gift for MacBook owners who love the feel (and look) of a book, a case that looks like a beloved leatherbound volume. Now they just need to make one for Kindle and Nook! Ban the Books in Libraries ‘Cause We Have Digital? A recent New York Times blog discussed a school library where all 20,000 books were discarded and replaced by digital media because apparently the librarians designing the place do not see any value whatsoever in physical books. So much for the middle way. Why do I like books? I can read one outside in the sunlight without causing a carbon footprint and get it sandy at the beach yet still have something I can pass along to my public library or a Goodwill so it can be read by someone of low income. I can hold the book in my hand and have the pleasure of seeing how far I’ve read by tipping the spine and looking at all those signatures I’ve worked through in one sitting which is very satisfying. I can run my hand over the beautiful jacket and pages (if it’s a well-made book–the ones printed on newsprint with hideous covers? not so much). If I’m reading electronically, every book offers the same visual/tactile experience. If it’s nonfiction, I get a lovely linear reading experience. If it’s light reference, I can bounce around at will guided by the table of contents, the index, and my eye which catches sidebars and illustrations as I thumb through it. If I am reading electronically, I am dependent on someone else’s navigation, and I’m less likely to happen across text that catches my eye (“Search inside this book: Surprise me with a random page” doesn’t offer that option). I can easily see the organization of the book’s information when I have a tactile object. I know I’m towards the self-help book if I pop into it at the program section, and I know I won’t understand that section completely unless I go back into the beginning of the book where the problem is defined and the author explains how we came to have this problem. When you access information nonlinearly through digital means, you don’t see these structures. You just pop in and pop out without context. I’m not against electronic delivery of information by any means. But without access to physical books, will kids develop the valuable skills that are honed by reading a physical book? What sort of news do people most want to share? The New York Times analyzed which of their articles were most likely to be forwarded to others. The results? If it’s positive, in-depth, and awe-inspiring, people want to share the good news.